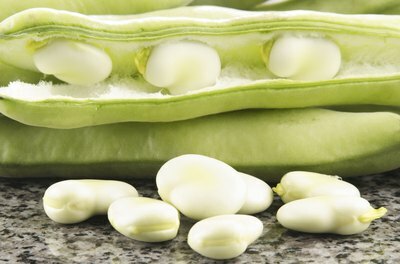 The broad bean, also known as the fava bean, faba bean and horse bean, is the original and only bean of the Old World. A vetch, related to the pea families, and a legume, it has been used as a human food source for more than 8,000 years and has made a lasting mark on European, Middle Eastern and Indian cultures. It has served as one of a collection of vegetative protein sources throughout history and remains a popular fresh and dried vegetable through much of the world today. The broad bean originated in the Mediterranean, probably in North Africa. By 6,500 B.C. it was being used in Israel and much of the Middle East, an area that continues to regard the broad bean as a staple food. From there its use spread east and west, into India and southern Europe. It is now grown throughout much of the world. It's most popular in the oldest of its territories; beloved in the entire Mediterranean Basin and India where it is an assumed standard food. The broad bean is a cool weather crop, grown in late fall, winter and spring, but seldom in the summer in any but the coolest of regions. It tolerates most soils, though alkaline soil can reduce the amount of nitrogen the plant is able to fix into the soil. It does poorly in saturated soil, but otherwise it is hardy and versatile. Nitrogen fixing occurs when the plant extracts nitrogen gas from the atmosphere and symbiotic bacteria in the plant store the nitrogen in nodules on the plant's roots. After the plant dies, nitrogen is slowly released into the soil. The broad bean is used as a nitrogen binder, a green manure, as hay and as fermented bean-plant silage. The beans and dried plants are also used as animal fodder. Broad beans are recommended as a green manure for home gardens because it is easy to work into the soil and decomposes quickly. 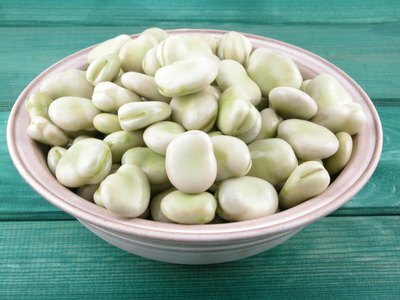 Broad beans are used in the same general way as dried New World beans such as Lima and navy beans. They are an integral part of many soups, stews and pasta dishes. The well-loved Italian pasta fagioli is traditionally made with fava beans. It is a common ingredient in the Iranian pilau dishes, the fundamental ingredient in Arabian ful and is used in Arabian and Israeli felafel and hummus. Broad beans are the classic ingredient in the French cassoulet. They were supplanted by flageolet beans only after they were imported from the New World. Similar substitutions can be assumed in most slow-cooked bean stews and porridge throughout Europe and the Middle East. The beans are also eaten fresh, much like Lima beans, fresh peas and edamame. Fresh and dried beans are served as a common street food in much of the Middle East and India; a classic nosh indulged in as a small, satisfying highly seasoned finger food. The fresh young growing tips of the beans are used in the same way as pea shoots, steamed, poached or lightly sauteed. 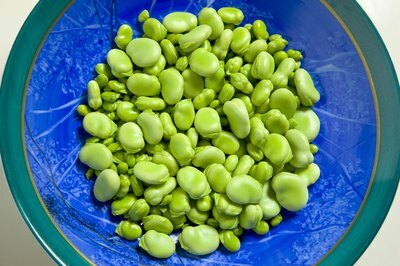 Just as New World beans supplanted many of the historical food uses of broad beans, broad beans can be used as substitutes in many traditional dishes using New World beans. Substitutions for Lima beans and some of the larger forms of dried kidney and butter beans are particularly appropriate. 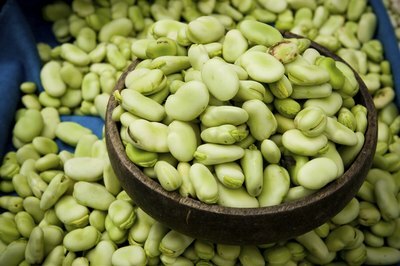 Fava beans, fresh and dried, are becoming more common in ordinary American supermarkets and can be experimented with in a number of ways. The one thing to consider about broad beans is the heavy, coarse nature of the skin. It can be eaten, but it is tougher than Lima bean skin and is often removed during meal preparation. It is either slit and removed with a paring knife in the case of fresh beans, or rubbed off by hand in the case of soaked dried beans. 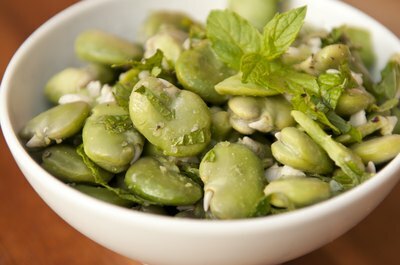 Broad beans are poisonous to a small percentage of people. These individuals carry a mutation on at least one X chromosome causing an enzyme deficiency called G6PD deficiency. The effects can be fatal. Symptoms include sudden jaundice, anemia and blood in the urine. Most people with G6PD deficiency will not manifest the sensitivity, but for those who do, broad beans should be avoided.